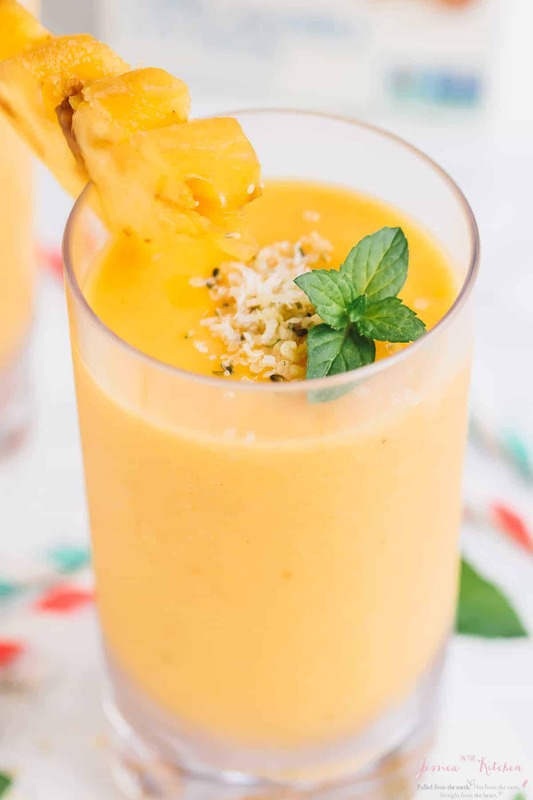 These Pineapple Peach Smoothies are made with only 4 ingredients! They’re creamy, refreshing and vegan! Do you ever bite, sip or smell something and it immediately tastes like summer? That’s what these Pineapple Peach Smoothies do to you. Bite into that pineapple on the side, sip on the drink, and smell it with all that glorious mint garnish and you’re instantly transported to somewhere with a glorious beach and beautiful sandy shores. This smoothie not only tastes amazing, but it’s SO easy to make. 4 ingredients friends, just four! Is it insanely hot by you, or is that just here? Today actually wasn’t that bad since it rained yesterday, but it’s been quite the intense weather of 90+ degrees daily. As a result, I’ve been drinking all the water, eating all the fruits, and downing all the smoothies. 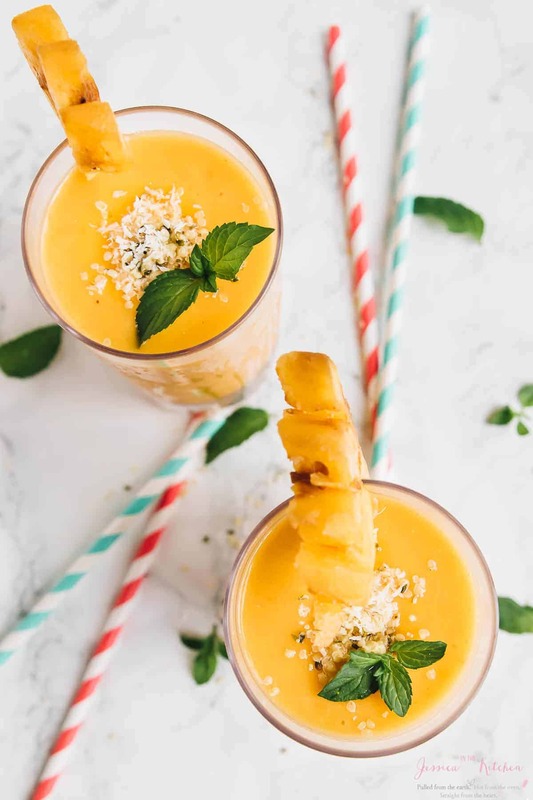 These Pineapple Peach Smoothies are no exception – I guzzled these down. They were SO refreshing and so yummy I had to stop myself from grabbing another. 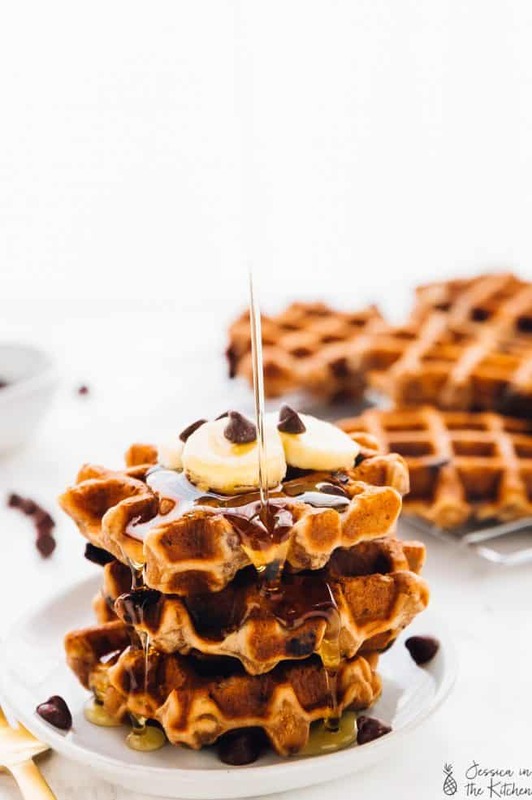 I made these babies with my absolute favourite, Silk® nutmilk. 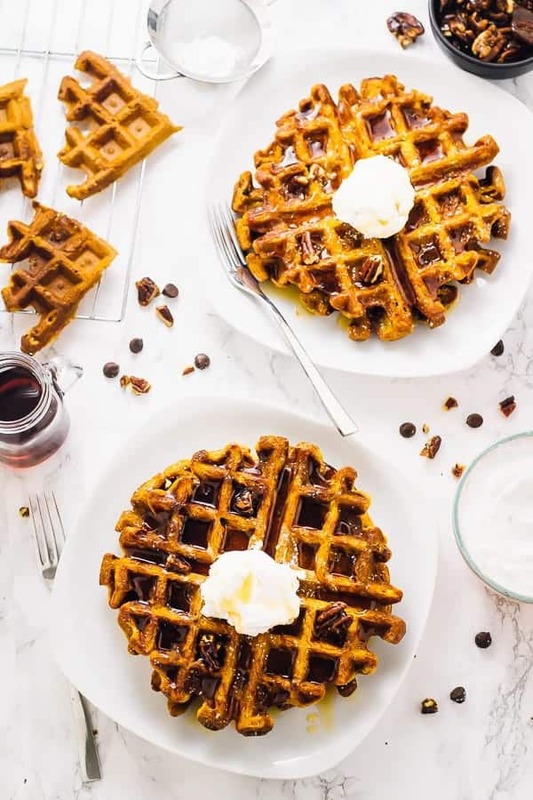 More and more, I’m hearing so many readers and friends complain about not being able to consume dairy, and probably my favourite part about being a Silk® Ambassador is that it means you can enjoy all your favourite milk recipes with their nut milk instead, without any flavour loss or worries at all! 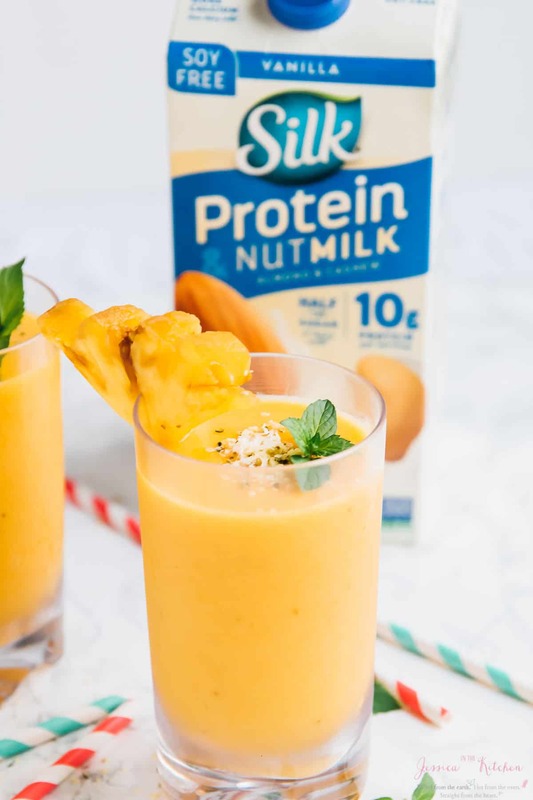 I used the new Silk® Protein Nutmilk, made with 10g protein (YES) so that this smoothie could easily be a filling and delicious breakfast! Hello full stomach all morning long. So let’s talk about these gorgeous Pineapple Peach smoothies. That name, doesn’t it just roll of your tongue? It sounds like no matter what you do, it’ll taste delicious, and that’s so totally true. 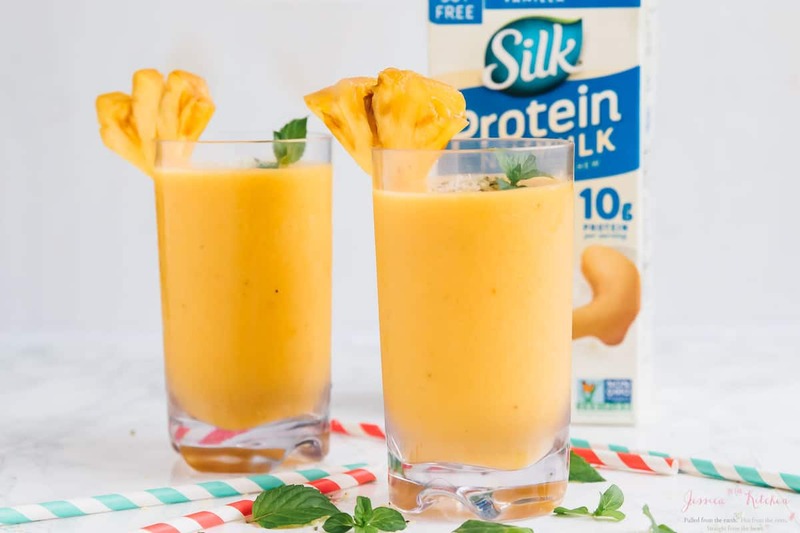 I used frozen peach slices, a frozen banana and fresh pineapples with the Silk® Protein Nutmilk to make these smoothies. Just four ingredients is all it took to bring these together. I actually lined my peach slices on a baking sheet, then froze them, but you could definitely use already frozen peach slices. I always buy my bananas, then let them get super spotty and brown, then strip the skin and freeze them too since frozen bananas make the creamiest smoothies. Both of these frozen fruits meant that no ice was needed – we don’t want to water down any of the divine flavour in these smoothies. 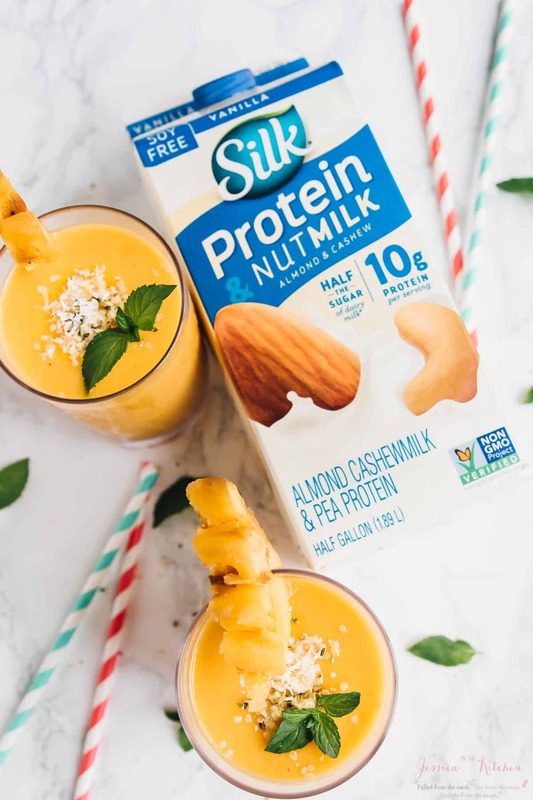 The Silk® Protein Nutmilk flavour works perfectly with these smoothies in that it’s so subtle, you wouldn’t even know this was a vegan recipe – which is always my goal. 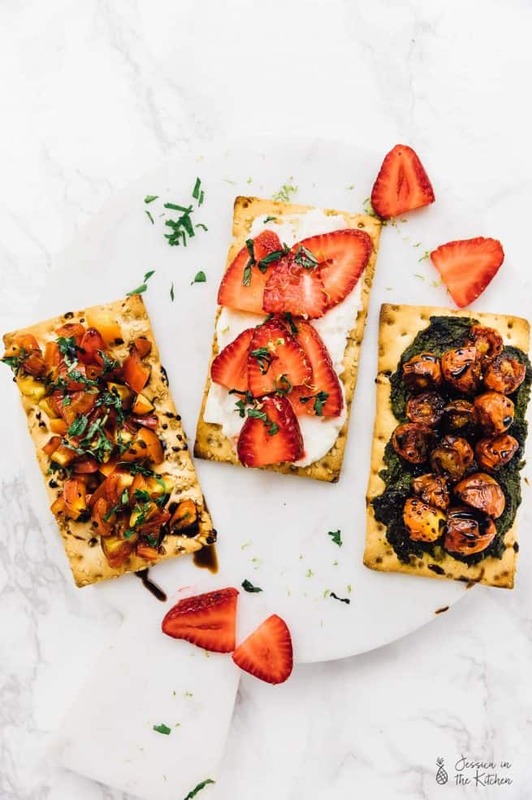 I’m telling you, you could serve these at your next bbq or day time party! Everyone would completely enjoy them and want to keep going back for more. What’s more, you could totally customise them too. Add in some strawberries for a more pink colour, or even blend the mint into the smoothies if you want. Either way, you’ll definitely enjoy! P.S. – can we work on making that beach and sandy shore fantasy a reality, please? Mix all the ingredients in a high speed blender. Garnish with mint or coconut if you want. Enjoy! I recommend that you drink your smoothie as soon as you make it. If you must store it only do so in the fridge for no more 24 hours. You can add any additions that you want to these smoothies. I like adding in some coconut flakes and hemp seeds and even mint to add to the flavour. 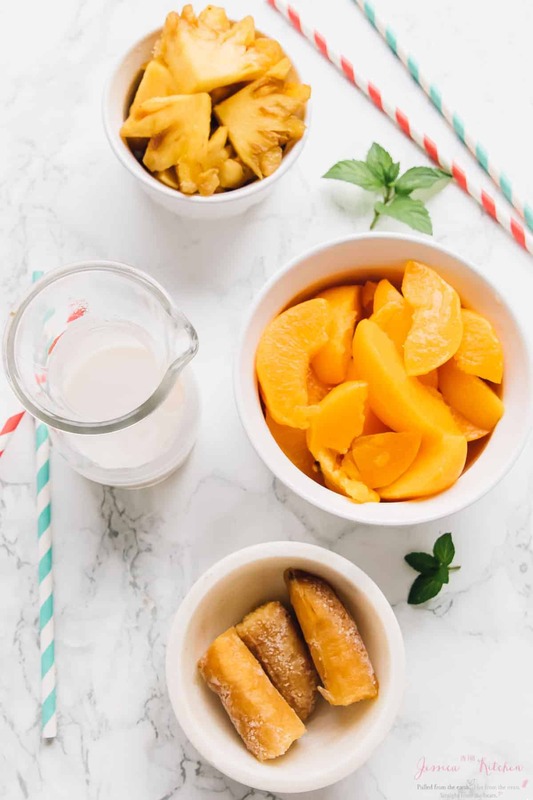 If you try these Pineapple Peach Smoothies please let me know in the comment section below, or tag me on instagram with the hashtag #jessicainthekitchen! For more exclusive recipes follow me on Instagram AND on Snapchat: jessinkitchen. This is a sponsored conversation written by me on behalf of Silk. The opinions and text are all mine. Thank you for supporting the brands that support Jessica in the Kitchen! I love the tropical aroma of pineapples. This sounds like a very tasty smoothie. Thanks so much Angie!! It really is! I’m now seriously craving this smoothie! It is super hot here (unusual for the UK!) and this pineapple & peach number would go down a treat. I love using nut milks in my smoothies. Yum. I’ll let you know when I make it! Aw thanks so much Liana!! I hope you enjoy it so much!! So delicious. I switched it up by using fresh peaches…including the skin, and some frozen, ripe bananas that I first thought I might use for banana bread. I’m so happy to hear you enjoyed these!! Sounds so delicious, Thanks so much for your feedback!